The monthly technology evening was held on 7 November at the Durban Country Club. Verlan Govender of Swagelok gave an interesting presentation on the basics and principles of hoses, to an audience which included a broad spectrum ranging from experienced engineers to students. It is pleasing to see so many students attending these meetings and interacting with people with years of industrial experience. 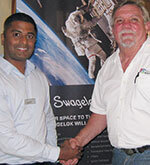 Hennie Prinsloo (right) thanks Verlan Govender after the presentation. Verlan’s talk started with a reminder of factors that can influence the life expectancy of hoses, and aspects to consider when selecting them. Construction of various types of hoses was covered, from choice of core tube material and reinforcing layers, through to alternative end connectors, before discussing storage, routing and installation requirements for the various types. He reminded the meeting that the hose core was not the pressure containment element, but that task fell to the reinforcing and covering layers. Industrial hoses are often subjected to all forms of abuse ranging from dragging, tight coils and being driven over, so taking care of the external surface is very important. Some examples of hoses with damaged covers were handed around for inspection and particular attention was drawn to the need to ensure adequate bending radius so that kinking would not occur with the possibility of resultant failure. Other failure modes were also discussed including failure of convoluted metal cores due to vibration. Choice of a suitable hose for an application was covered by a checklist and the meeting was reminded of the need to perform regular inspections, with the interval being determined by the severity of service. Many questions were asked, all capably answered during Verlan’s talk which was thought provoking and beneficial. The meeting concluded with networking and refreshments to the usual high standard of the Durban Country Club. The branch thanks Swagelok for co-sponsoring the evening.